Calvary Assembly of God had its beginning in the Christian Missionary Alliance Movement in the year of 1906. Services were held first in a tent. Following the tent service, the meetings were held in the homes of the members. It was also this same year that the outpouring of the Holy Spirit fell in a little church mission on Azusa Street in Los Angeles, CA. Soon this "Pentecostal Experience" moved across the nation affecting practically every state and locality. In 1907 services were moved to the Wayne Annex Building. From 1908 to 1910, the Bible evidence of speaking in other tongues was revealed and the Holy Ghost poured out upon the people. The congregation experienced remarkable growth during this timne of Pentecostal outpouring. The Church then came out of the Christian Missionary Alliance into Pentecost as an independent assembly. 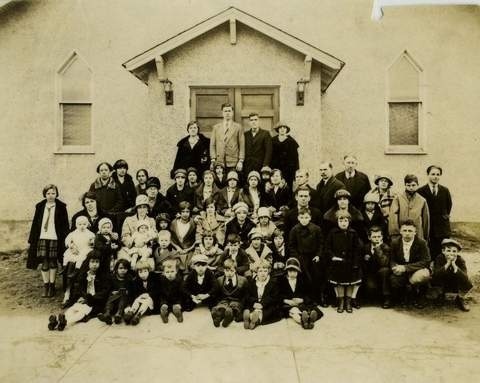 On July 18, 1930, at a special business meeting held in the church, the Church was officially set in order and was brought into the fellowship of the General Council of the Assemblies of God with headquarters in Springfield, Missouri. At the same time, the name of the Church was changed from the Pentecostal Assembly to Calvary Tabernacle. In order to have the name of the church coincide with that of the General Council of the Assemblies of God, it was officially changed at a business meeting of the church on January 9, 1957 from Calvary Tabernacle to Calvary Assembly of God, Inc., of Waynesboro, Pennsylvania. The congregation has been blessed over the years with pastors and leaders who were highly anointed of God and effective in their ministry. Today, we are again seeking for a fresh outpouring of God's Spirit upon us in supernatural abundance. We "cherish our past" and rich heritage of faith passed down to us by our forefathers but we also "celebrate our future" as we anticipate the next and greatest move of God's Spirit in the world that will prepare us for the greatest harvest of souls for God's glory! We believe that the greatest chapter in our church's history is yet to be written!